Just remember when you are searching for a new practitioner always make sure they have adequate qualifications. Always chose a registered Acupuncturist. You can assess a practitioners qualifications through searching the two main acupuncture associations in Australia. These are the Australian Traditional Medicine Society (ATMS) or Australian Acupuncture & Chinese Medicine Association (AACMA). Practitioners should also be registered with the Chinese Medicine Board of Australia under the Acupuncturist category. All credit for this article goes to Kristen Horner Warren. 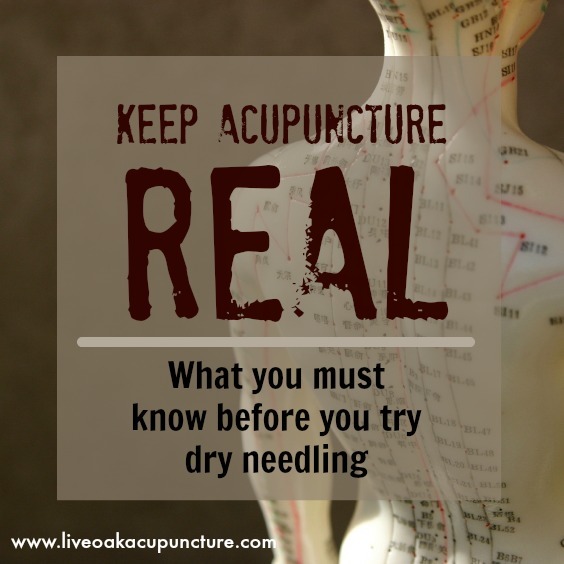 She has graciously given me permission to repost her excellent article about the differences between Acupuncture and Dry Needling. To see her original article please click on the link in her name under the heading. As the day of needling practice proceeded, I became more and more concerned. In Chinese medicine school we spent over a year in the classroom learning about safety considerations surrounding acupuncture before we so much as touched needles. Like high school students in driver’s ed who are forced to view videos of high speed collisions and look at photographs of the mangled wreckage of a drunk driver’s cars, we spent weeks studying cases (rare as they are) of people who had been harmed by inappropriate needling. We examined dozens of CT scans which showed how very close the apex of the lungs are to the underside of the trapezius muscles. We palpated the bodies of our classmates, learning to locate critical structures by feel. We discussed the fact that movements associated with respiration and/or digestion can cause a needle placement that was initially safe to become unsafe as the patient rests with the needles in place. We were encouraged to plan our treatments to make use of lower risk points on the extremities whenever possible. Next PostNext Singapore zoo heals animals with Chinese Medicine.